Photos from the “Banned Expression in Tibet” Event at Kings Place and Thanks Yous! 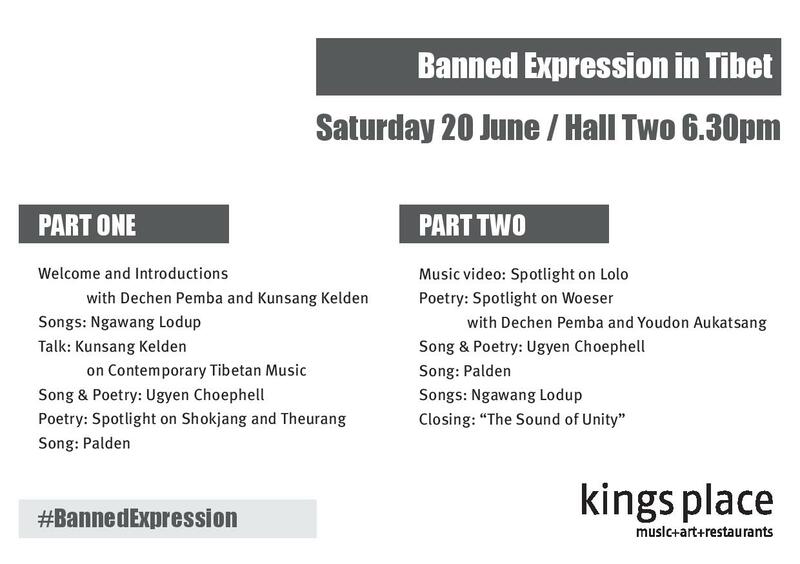 I’m happy to report that the “Banned Expression in Tibet” event at Kings Place on 20 June 2015 went very well! Thank you to everyone who came along and made it a memorable night! We had such a great team of performers and crew so that on the actual day, it wasn’t stressful at all but really fun and everyone played their part beautifully. I just wanted to post some of the amazing photos of the event which were taken by our good friend Luke Ward at Kings Place. If anyone re-posts the photos from here, please be sure to credit him as the photographer and mention that the photos were taken at Kings Place, thanks. “Banned Expression in Tibet” opened with a choreography based on Sherten’s song “The Sound of Unity”. Kunsang Kelden, co-founder of Lhakar Diaries and Dechen Pemba, editor of High Peaks Pure Earth open the evening. Sonam reads a poem by Theurang called “Today, I wish to offer three prostrations towards Lhasa”, translated by Bhuchung D. Sonam. Ugyen Choephell sings his own compositions in modern style. At the end, the performers all sang “The Sound of Unity” by Sherten. For everyone who came and enjoyed the visuals we used as background on the night, here they are below. Many thanks to our talented graphic designer who offered her services and did all the artwork for Banned Expression, often to tight deadlines! Finally I’d like to thank everyone who gave their time and effort to making “Banned Expression” a success. It’s going to be a long blog post but I wanted to take the time here to thank everyone who contributed and also make their contribution known! My website High Peaks Pure Earth has enjoyed an extremely fruitful partnership on Banned Expression with Voice of Tibet and Tibetan Centre for Human Rights and Democracy and their support has been unwavering these past three years. Thank you to FreeMuse for supporting Tibetan musicians and for sending a wonderful message of solidarity to us. Several Tibet-related groups helped with spreading the word, so thank you to Students for a Free Tibet and Tibet Society. A special mention must go to Tibet Society and Tibet Relief Fund for bringing their whole crew to the event and especially to Philippa and Riki for supporting the work of High Peaks Pure Earth. Thank you to Palden, someone who is somehow able just to turn up on the day and effortlessly pull off two songs amazingly! Thank you to Sonam who conquered her nerves and reached new heights! Thank you to Bhuchung D. Sonam for letting us premiere his translation of “Today, I wish to offer three prostrations towards Lhasa” by Tashi Rabten at the event. Sonam read it well and the full power of his words could be felt in the room. And thank you to Youdon Aukatsang who managed to fit Banned Expression into her already packed programme and effortlessly graced the stage like a true pro! A thank you must also go to A.E Clark at Ragged Banner whose translations of Woeser la’s work are so beautiful, the two poems that Youdon la read, A Vow and Scream are both to be found in Tibet’s True Heart, a highly recommended book. And where would we be without our amazing crew members? Eli, thank you not only for your genius make-up and beauty skills but also for your support over the years for everything that we do. Eli was with us on Banned Expression from the start and looks after us all! From the Green Room to the Dressing Room to the way home, Eli had it all covered so that we were hydrated and had plenty to snack on, she thought of everything, even bringing flowers and scented candles to calm our nerves. Shu-Ting, thank you for your AV assistance and sorry you got stuck in the booth all night! Thank you JD & ND for lending a hand whenever we needed it and thank you to Luke Ward for his photos. Several businesses in London promoted Banned Expression by giving out our leaflets and having our posters up, including the Tibetan owned businesses Vintage Basement just off Brick Lane and in Camden and Kailash Momo Restaurant in the Tibetan hub of Woolwich. The lovely Nepalese couple at Rising Green Coffee Shop were similarly helpful, anyone in the Old Street area should check out their delicious momos every Wednesday! The Kings Place crew were a God-send and made us look professional, thank you Andrew, Delfina, Michael, Alex, Matt and all the Front of House staff. As this post shows, it takes a lot of people, planning, patience and support to put on a 90 minute show! 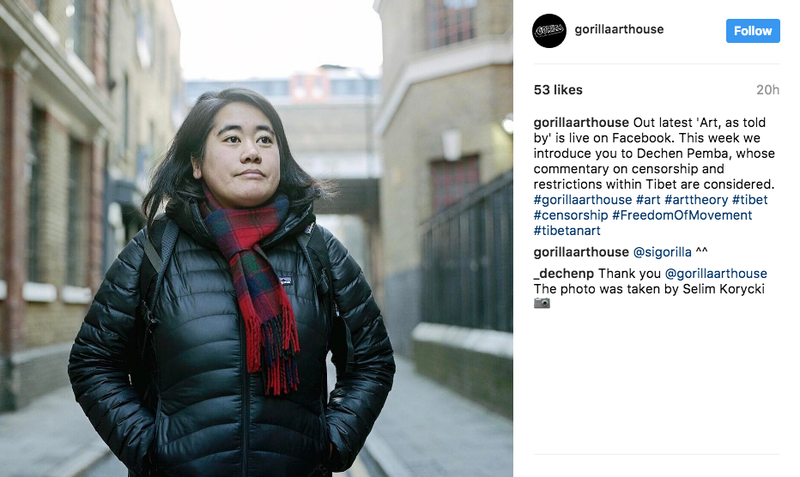 I hope that events like this will continue to be supported so that the incredible creative resistance taking place in Tibet today can be honoured and given a fitting space. 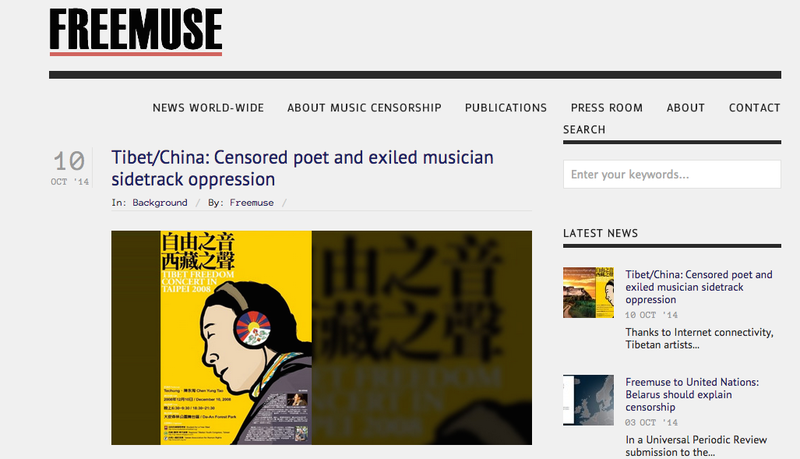 Last week, Freemuse, the leading defender of musicians worldwide, published my second article about music censorship in Tibet. It was also cross-posted on Global Voices. These articles have been commissioned by Freemuse and Global Voices for Artsfreedom.org. My first article was about music censorship in Tibet in general but for the second article I decided to focus on an unusual collaboration between a Tibetan inside Tibet/PRC, prominent writer and blogger Woeser, and an exile Tibetan musician, Techung. I’m really happy with how the article turned out, I interviewed both Techung and Woeser separately and they were both incredibly gracious and accommodating with their time.